Italicised articles are old and unrevised. The theory of special relativity revolutionised not just our understanding of time but our understanding of space too. I have already described the phenomenon of time dilation, whereby pairs of clocks in uniform relative motion each tick more slowly with respect to the other. A closely related effect is the phenomenon of length contraction (sometimes known as “Lorentz contraction”, “FitzGerald contraction” or even “Lorentz-FitzGerald contraction” after the physicists who predicted it on the basis of a crude forerunner of special relativity). Both time dilation and length contraction are immediate consequences of the Lorentz transformation (which I described in my article Relativity, FTL and Causality), and hence an essential part of any relativistic understanding of the world. Figure 1 A rod flies at 0.4c past Alice, a stationary observer. The white grid shows Alice’s coordinate system. The rod is shown at four successive times. The right and left blue lines are the world-lines of the front and back of the rod. As ever, I’ve also included the past and future light cones of a representative event. The method that Alice uses to measure the length of the rod is quite straightforward. She waits for the back of the rod to pass her and notes where the front of the rod was at the same time (to do this, of course, Alice has to set up a coordinate grid in some manner; I’ll describe in a future article how she might do so). When Alice knows where the front and back of the rod were at the same time then working out the length of the rod is easy: she just uses a ruler to measure the distance between those two locations. In the example in figure 1, she’d find the length of the rod to be a little over 18 units. Figure 2 The same sequence of events but also showing Bob’s coordinates. I’ve drawn Bob’s coordinate grid in Alice’s frame, but also suppressed her grid except for its axes for clarity. Notice that something curious has happened: as measured by Bob the rod is exactly 20 units long. Alice and Bob thus see the rod as having different lengths! 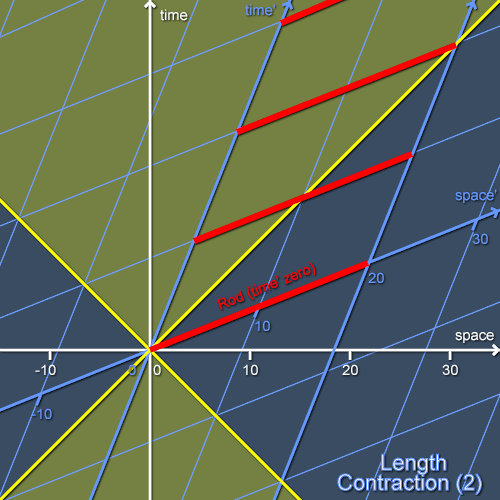 The shortening of the moving rod as seen by Alice is length contraction. People in other frames will measure yet other lengths. Each person will consider all the others to be measuring the positions of the front and back of the rod at the wrong times too! However, there’s one frame that has a special value for the length. This is Bob’s frame, the frame in which the rod appears to be at rest. The length measured in this frame is called the proper length of the rod and is the closest thing in a relativistic world to our classical notion of length. Just as the proper time is the time that’s inherent to a clock so the proper length is the length that’s inherent to a rod. If you look at a clock moving past at constant speed you’ll see it both contracted along its direction of motion and running slowly. The factor by which it contracts is the reciprocal of the factor by which it runs slow: if each tick takes twice as long as you’d expect for a clock at rest then the clock looks like it’s shrunk by half along its direction of motion. (The lengths transverse to the motion are not affected.) And, as I’ve said, all other objects will be affected similarly. This means that length contraction and time dilation are not just the peculiar behaviour of specific types of clocks or measuring rods but really properties of the ways that different observers carve spacetime into space and time. When the original theorists who designed the Michelson-Moreley experiment(Michelson and Morely I presume) decided that in order for the ether to exist there must be a dimensional contraction along the axis of travel making it impossible to detect the wavelength shortening effect of traveling through the ether, Einstein comes along and says. "There is no ether. That's why you can't measure it." that's okay. but then he goes on to say that there is still a dimensional contraction along the axis of travel. So there is an ether? or what phenomenon did he have access to which implied the dimensional contraction? The rod is shown at four successive times. & not: The rod is show at four successive times. My understanding of the disproof of the ether is that in order for it to exist, it would have to be rotating around the sun exactly in lockstep with the rotation of the Earth, for those experimental results to be valid. Needless to say, this is very unlikely (as the Earth is not the center of the universe), and it was dismissed in favor of relativity afterwards as a result. The apparent length of the rod will always be exactly equal to it's rest length multiplied by it's doppler shift, with blue object appearing longer and red shorter. More precisely, each portion of the rod is lenghtened/shortened by its doppler shift since unless it's coming directly at the point of observation then each portion will be at a slightly different shift. This is true whether it's the rod that is moving, the observer or both. The doppler effect is extraneous to these diagrams, as we're measuring along the axes of simultaneity and not concerning ourselves with the path of signals. Why can't Alice measure the length of the rod by starting a clock when the front end passes her, and then stopping her clock when the back end passes her?